While driving on a gravel road, I was surrounded by birds making alarm calls. I stopped the car and some of the birds landed on the road in front of me, still making loud calls. I looked at them without recognition as the light was low-contrast and the birds were difficult to discern on the gravel road (before I applied Photoshop). Some others circled around me, coming within 5 meters or so. 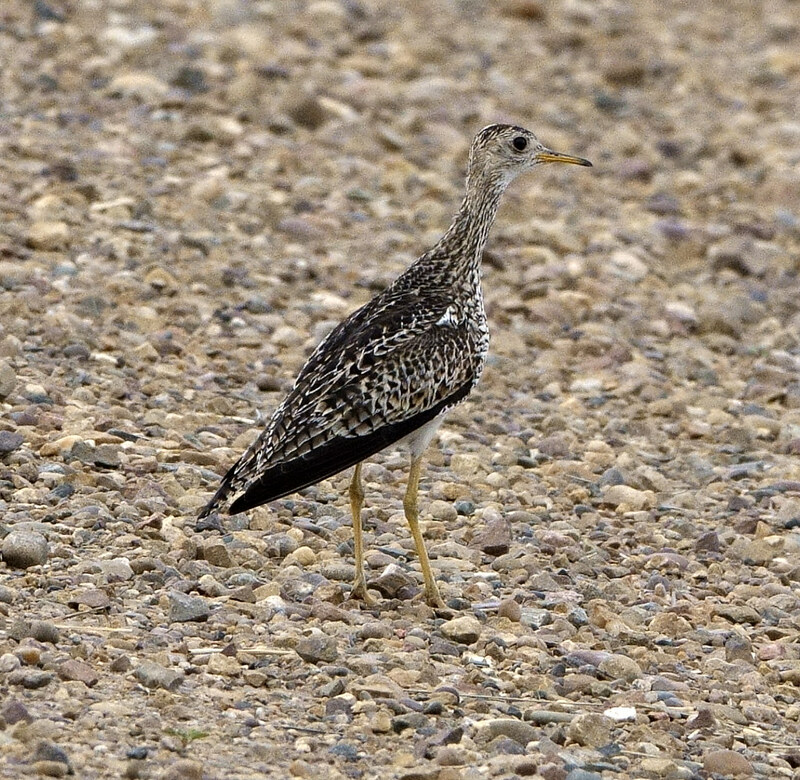 The Sony was handy and I snapped a couple of photos of one of the birds on the gravel road. Only later did I read that they often nest in colonies. Likely some Youngsters nearby. More later…. Really nice. Can you identify? Is that a yellowlegs? And where are you located? Since this is a birding BC website people would probably assume it’s in BC. It would be nice if when you post a pic of a rare bird that you give the location.There are many people who would love to see an Upland Sandpiper.But maybe for some reason you want to keep it secret or couldn’t take the extra 2 seconds to do it.Just my 2 cents worth. Thanks Hawkman.. Yes the bill is not a yellowlegs.. Now where was he spotted? Nice find and photo. Cheers!